The happiness of flip flops. No, don't worry. It's not all. But I just had to acknowledge how much I ♥LOVE♥ (yes, with love hearts) living in Cardiff when the weather does what it's doing at the moment. My garden becomes a heat trap, and sunlight pours in through the open windows rendering my formerly cold and damp residence a warm, bright and airy home. I don't wish to sound as though I am putting Number 87 down; certainly I am no troglodyte, but this is South Wales after all, and a certain amount of realism is required. So, yes, the delights of open-toed footwear are being fully appreciated by yours truly. I may even allow myself to wear the green sun hat I bought in Forever 21 in S.F. last year, but sense that one step at a time is probably the safest way to proceed. Mustn't over do it on the second day of sun. I imagine that this warm weather is going to inspire a batch of ice-cream making, since, to be frank, my oven is simply not going to be switched on in the next few days. But for now, I have had another of my 'what is there saved on the hard drive?' rootles and found this chilled and chocolatey delight from several months ago. Yes; there are many edibles that get their picture taken and then languish, woefully, on my computer for many months. I've had some lemon curd macarons begging me to write about them since January, but I'm showing them who's boss. 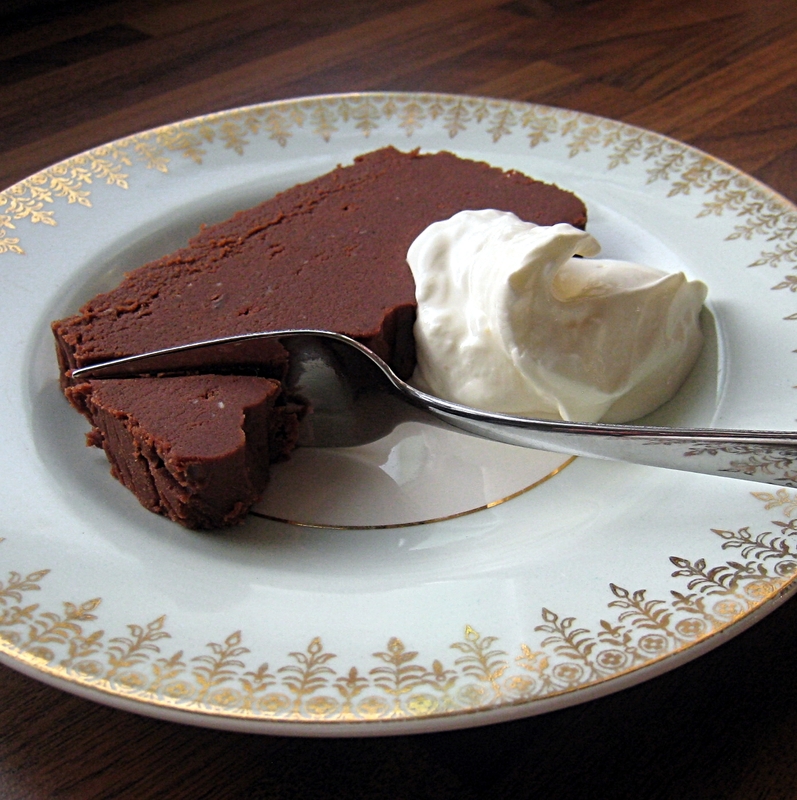 Actually, today's truffle cake is a brilliant warm weather offering. You don't need an ice cream maker, and there are no raw eggs involved, the presence of which I happen to believe is the main reason most people are reluctant to wallow in the dreamy, rich pleasures of a semi-freddo. Their choice. I'm here to offer a solution, not a judgement. First, the prep: get yourself a loaf tin and line it with clingfilm. Then add a second lining of clingfilm. Not joking, this took me ages. I hate clingfilm. Mix the ingredients together until smooth and amalgamated. You do not need me to tell you that I used Malibu, but brandy would be lovely, as would whisky. Or indeed Cointreau, the great, orangey love of my liqueur cupboard life. Pour into the lined tin, smooth down and chill over night or until firm (around three hours I'd say, but overnight is easier for me). Serve in (thin!) 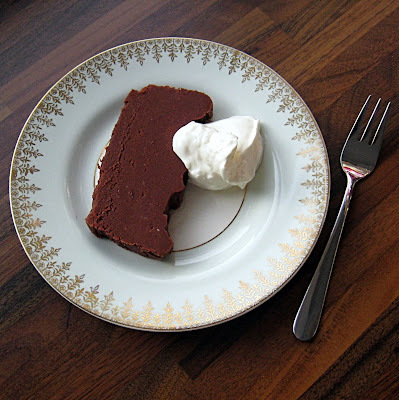 slices with cream or crème fraïche. I'm never going to get bored of those hot pink melamine teaspoons. Never. I believe I may have made a promise to share a jam recipe with you at the end of my Victoria Sandwich recipe. You're in luck; it's a promise I am going to keep. Making jam is the type of cooking that used to make me feel like an elderly lady, the sort who has been married for a hundred and two years and counting, is a fully paid up member of the W.I. and embroiders her own lace handkerchiefs in the spare moments she finds throughout the day. I won't lie; it's a feeling I rather like. Ladies like that keep a house how it should be kept, and having homemade preserves in the cupboard makes me forget that the garden needs weeding, the shirts ironing and clingfilm replacing. And that I haven't the foggiest idea how to embroider lace hankies. I suppose I have the rest of my life to learn, but then that would perhaps jeopardise my future dream of becoming a distinguished, mildly lined (as in barely-there wrinkles) but fully grey, silk jacket wearing sybarite, the sort of immaculately groomed old chap who drinks pink gins on Thursday afternoons and offers pre-dinner callers glasses of the finest single malts and invitations to stay for 'supper'. It's a nice dream, isn't it? I don't really know how I got here from simply having mentioned jam. Let's get back to the point. Jam is easy. I make it whenever I have a nice selection of empty jars, and I happen to think that this batch - made just before Christmas last year after a freezer raid produced a bag of raspberries and some forgotten about Alphonso mango purée (I am going to do more Alphonso mango recipes when they come into season this year, I think they are my favourite fruit) - is my best yet. However, I need to make a disclosure for our mutual benefit: I used a pectin product. In the past, I considered this to be cheating - and I hate cheats - but have changed my mind. The thing is, I've actually had (read: survived) the unpleasant experience of making marmalade that didn't set properly before and after all the effort involved I was really angry about it. Pectin powders, syrups or even enriched sugars take away all the guess work, and turn jam making into a snap. They also mean you can use less sugar. I actually used this, which I picked up in Italy, but any supermarket will have comparable products, such as Certo. Just read the label and adjust the method if necessary; most will be the same. I'd actually love to hear how many of you make your own preserves and what your favourites are, so do please leave a comment here or on Facebook. Tell me if this post inspires you to try your hand at 'putting up', or if you too have lived through failure. Come on people: let's make this a jam throw down! I'd also like to draw further attention to the fact that SAVEUR are hosting their Third Annual Blog Awards; I'd love a nomination in either Best Cooking Blog, Best Cooking & Desserts Blog or Best Food Humour Blog. Mix all the ingredients in a large, heavy bottomed saucepan. Allow to sit for as long as it takes to complete stage 2. Get your jam jars - I made 4 standard sized ones (that's 380ml capacity, fact fans) from this amount - and wash them in hot soapy water. Rinse well, place on a baking sheet (standing right side up) and dry off in a cool-ish oven, around 80-100°C is fine. Leave them in there to keep warm for now. Wash the lids too, and boil them in a saucepan of water for 10 minutes. You now have sterilised jars and lids; place the (drained!) lids in a clean bowl until ready to use. Now start the jam. Bring slowly to the boil and stir constantly to ensure the sugar is all dissolved thoroughly. 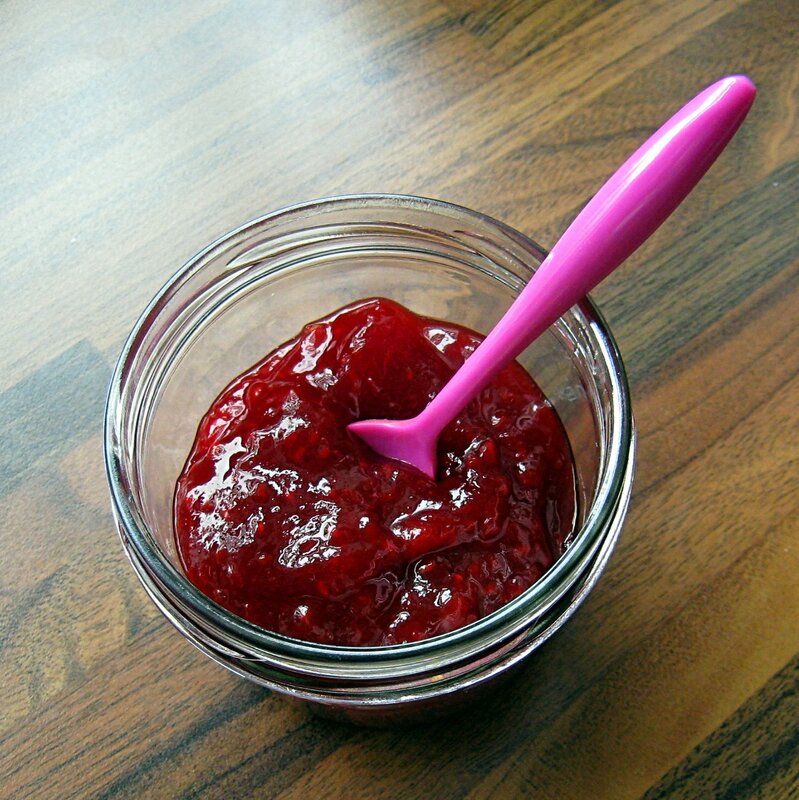 If you want chunky jam, try not to crush the fruit too much. Once at a full boil, stop stirring and boil for a full 5 minutes. Then pour into your heated jars and apply the lids. Quickly invert the jars for a few seconds, then stand the right way up. The jam will set once it cools completely. 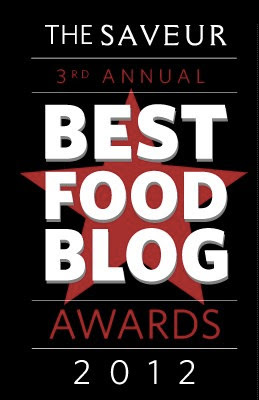 But SAVEUR have just opened nominations for their 3rd Annual Best Food Blog Awards. Do you know how much I want one of their 'Best of the Web' badges? Frickin' loads, that's how much. If you could spare the time to nominate me (and I know how undignified it is to plead with you outright... but I am without shame. ), I would love you forever. FOREVER! It takes thirty seconds and the page at which to do it is here. I have cake in the oven. My sponges peaked a little and so my slices refused to sit perfectly flat. The annoyance! Yeah. As you can see, I am annoyed at my Victoria Sandwich. I feel the same way that parents from a staunchly Conservative family must feel when their first born gets to voting age and plumps for the Labour Party instead. Disappointed. A little shocked. And hard done to. Still. Taste is everything, and if we all judged on looks alone, well, think what the world would be like. Besides, those peaks do add a certain excitement to the curve of the top layer. Coupled with the almost hidden and entirely co-incidental jammy drips we have what can only be labeled 'sweet provocation'... Or is it just me who finds cakes to be provocative? I'm breaking an unwritten rule that I laid down when I started writing Delicious Delicious Delicious with this post and I feel a bit uneasy about it. See, I promised myself I'd never do Victoria Sandwich. Turns out that isn't actually true. And thanks to television shows like The Great British Bake Off, the classics are becoming trendy again. Plus, someone at work asked me what the secret to a good sponge was, and I thought I may as well have a play in the kitchen and post the results. Now: one thing up front. 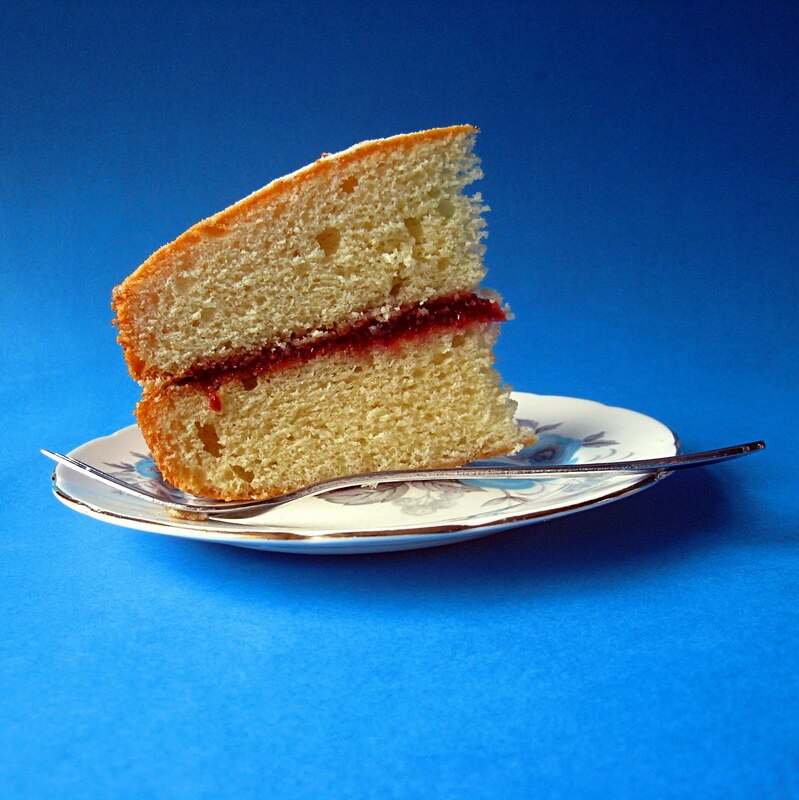 This is a Victoria Sandwich, not a sponge. Yes, I've titled it sponge, but that's merely for Google to help people find this post. The fact is this - a sponge cake does not contain so much butter as this cake usually does. Sponges rely on beaten eggs for their leavening, and at most contain a little bit of melted or clarified butter for tenderness. Examples include classic génoise and biscuit de savoie (which is used for thinks like Swiss Rolls). I'm not a professional and don't want to get overly technical, but please: let's call a spade a spade. Normal Victoria Sandwich is really no more than your typical layer cake: equal parts flour, sugar, eggs and butter. But there is a difference in the recipe I'm giving you today and the ones I've tried before. It's not altogether a radical departure (you still have to bore yourself to tears waiting for the butter and sugar to cream together), but it is nonetheless unexpected (to me, at any rate). Spoiler: it's additional baking powder. Lots of people use self raising flours for baking cakes, though I stopped doing that years ago. There's nothing wrong with them, I just like to be able to add leavening in the proportions that I choose, and don't have enough shelf space (or cupboard space - I remember the awful days of only having shelves. Vile.) for several different kinds of flour. I've always found Victoria Sandwiches tricky though, because if you add too much baking powder, you can taste it in the finished cake (soapy metal - yum! ), and no matter how high the rise you get or perfectly fluffy the texture, it's not worth ruining the flavour for. Then there are recipes that rely on only self raising flour and no additional baking powder. Well, these are inevitably gummy, tough and flat. A whole host of other explanations are sometimes given - over mixing, curdled batter - but, trust me: it's the baking powder. 9 times out of 10, it's the baking powder. For each egg in the batter, add a 1/2 teaspoon of baking powder as well as using self raising flour. Another trick, gleaned from my friend Lucy (she who likes Red Velvet) in my final year of university: weigh your eggs (in the shells is fine) and just use equal weights of flour, butter and sugar. Then your ratios are always spot on. The batter is quite forgiving, so adjust to whatever tin sizes you have. For example, if you have a deep sided 20cm round tin, I'd use 3 eggs per layer, for a nice tall cake. First of all, make sure everything is at room temperature to start with. Otherwise, no matter how careful you are, your batter will curdle. Which isn't going to get you sent to prison, but will piss you right off. Pre-heat the oven to 180°C and grease and line the bottoms of two 20cm round sandwich tins. I use a free standing mixer (getting married gets you a Kitchen Aid), but you can do this all by hand. In my teens, I would use a wooden spoon, so don't get all wimpy on me. Cream the butter and sugar until they are, well, like thick cream. Smooth, not gritty... Practically white. At this point, you can add some flavourings, but then it won't be a true Victoria Sandwich. Still, I like to play. My current favourite is 2 tsp vanilla extract and the finely grated zest of an orange. Lemon zest is nice as well, or maybe some cinnamon. Beat the eggs in a separate bowl, and add them slowly to the butter and sugar mixture, beating constantly. You can chuck in a little of the flour (say 1 tbsp) after each few additions of egg to help prevent curdling, but you shouldn't need to if you are thorough with your beating and wait until the eggs and butter have properly come together before adding the next batch of beaten egg. Add the baking powder to the rest of the flour, and whisk lightly to incorporate. Then either fold the flour into the batter by hand, in three batches, or pulse it in using the stand mixer. Again in three batches, and stopping just as it seems fully mixed. Scrape the batter into the cake tins and bake for 20 - 25 minutes, or until done. Cool in the tins for 10 minutes and then remove and cool completely on a wire rack. Sandwich the cakes with jam. Mine was mango and raspberry. You may, with any luck, get the recipe soon.